My sweet, proper, southern mother of 91 years has always been curious. She loves learning and is easily fascinated by what she doesn’t know, or what she finds intriguing. Like car wheels. My mother has had a life-long fascination with car wheels. Safety, design, color, model and make are important elements in vehicle options for sure, but my sharp, smart and creative mother has been known to purchase one vehicle over another based on the artful design of its spokes, rims and tires. And though a stroke three years ago ended her driving, and though cancer has prompted her to exchange her license for a state issued ID, she still loves to take a ride in the car, and she never ceases to be amazed at the infinite variety of wheels on the road around her. “Who designs all these?” she asks every time we stop an intersection, pull into a doctor’s office or park outside a store. Her determined but arthritic finger points at the line of surrounding wheels. “Why are they all so different? And who needs so many kinds?” Her bright blue eyes spark at the ocean of metal orbs. Truthfully – I have no idea. I honestly never gave it much thought until Mom’s childlike enthusiasm piqued my writer’s curiosity and urged me to dig a bit deeper. Much like snowflakes, I now realize that almost no two spokes are alike. Indeed, they come in a dizzying array of style, size and design. Some are dark metal while most, it seems, are bright steel or aluminum alloy. And the types of molding, forging and casting used to create these wheels offer a variety of spokes as vast and unique as spider webs. Some are easily counted, with four, eight, even ten easily defined spokes, while others look the cross-section of a honeycomb. Mom’s stroke affected the left side of her brain, the right side of her body, and the vision in both of her eyes. Two years later, she developed cancer in her skull and now suffers lymphoma cells that impinge her optic nerves. Even so, neither of these conditions has stopped her from spotting the amazing array of wheels that roll by, or expressing an opinion about the ones she does and doesn’t like. Her tastes naturally run more to the classics, and thus away from gimmicks and fads. So, for instance, she has never cared for those chrome spinning centers that appeared to rotate backwards even as the car moved ahead, or that continued to spin even when the their vehicle stopped at a light. But she has always loved the wheels with multiple intertwined spokes that look like hand-woven steel lace or shiny metal filigree. 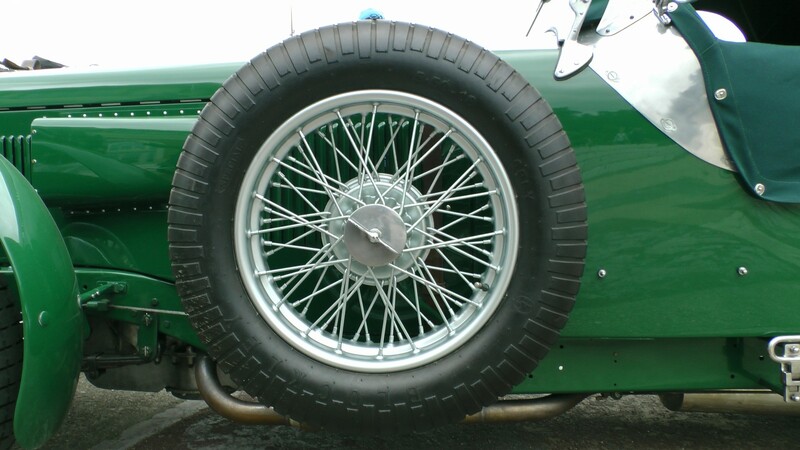 One thing I’ve learned is that, no matter how simple or complex, spokes have one primary job – connecting the outer rim to the center wheel for added strength based on the car’s weight, performance and tire size. Without them, manufacturers would have to create solid lumps of metal to hold the tires in place, and that would be too heavy for braking, agility and efficiency. So not only do they look good, they are important for car safety. Even so, the number of spokes doesn’t seem to matter, and most reflect style over substance in overall design. Wheel engineers use CAD (Computer Aided Design) and FEA (Finite Element Analysis) technology and expertise to determine structural, aesthetic, performance, environmental, and economic parameters, from the old, light alloy magnesium wheels, “mags,” to the steel and the aluminum alloy constructs of today, to keep up with ever-changing needs, demands and innovations. They even customize wheels for individual taste. Mom is a practical woman with resourceful ideas yet creative tastes. No wonder she is fascinated by an engineered art form that melds pragmatism, purpose and art to forge new design. I inherited Mom’s practical and resourceful DNA, but with a much heavier dose of the artistic. I recently finished my first novel, “The Vessels,” which is set for release next year. I applied real and virtual pens to empty computer and paper pages to create a story that will forge new life as a book or a possible script. I fabricated characters that will live as real in their literal skins as readers do in flesh and blood. I wove their tales like tapestries, then stepped aside to let them soar into the world on lettered wings. Before writing became the chosen expression, I worked as crew on many large, star-studded studio movies, serving as part of that critical balance between creative story and pragmatic location, actors, equipment and other elements to bring an idea to reality on the silver screen. In addition, I continually thrill to hear musicians turn notes from a page into lyrical music on stage, and admire new creations born from painters taking brush to canvas or sculptors culling an image from a block of stone. But I honestly never gave much thought to the center caps, rims or spokes of a car. Not until now. Not until Mom’s childlike enthusiasm broadened my awareness of other art forms and opened my eyes to the essential, inventive, innovative and never-ending art of the wheel.